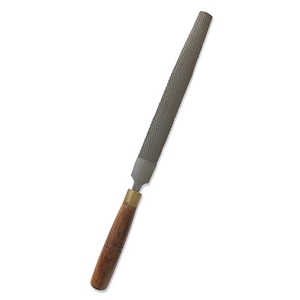 This heavy-duty imported cabinet rasp is ideal for the fast reduction of large amounts of stone and wood. The 12" rasp is made from carbon steel for durability and has punched teeth on its flat side as well as its rounded side. Its tang is set in the beautiful exotic hardwood handle tightly secured with a ferrule. The tool with handle is approximately 18.5" in length.